I made these for an adorable Halloween party that my friends over in the education/IS department threw last week. They weren’t the only themed appearances, either: there were spooky eggs, kitty litter cake, witch’s brew, and props & costumes galore! We ate dinner at Club 33!!!! For those of you who aren’t familiar with this hidden gem, Club 33 is a members-only venue located in New Orleans Square, right above the Pirates of the Caribbean ride and the Blue Bayou restaurant. Membership is something like $10K per year, with a base fee of goodness-knows-how-much and an interminable waiting list. Aside from an excellent view of the Halloween festivities happening down below our exclusive balcony, I absolutely loved the entire escape-from-Disneyland-within-Disneyland experience. The wait staff was incredibly attentive: after I asked for special dietary accommodations (the third course was fish or meat only, and I requested a meatless dish), the kitchen sent out individual appetizers–3 tuna bruschetta for my family, and 1 persimmon slaw for me! I was already impressed by the staff’s attention to detail, but the surprises didn’t end there. At one point, my brother mentioned in passing that we were there to celebrate my birthday (which is actually in the summer, but I suppose to us it was a birthday celebration of sorts). When the dessert course came out, there was a giant “Happy Birthday” scrawled across my plate of monkey bread and vanilla ice cream. Awwww, all the feels. Apart from one sour grapes of a hostess, the rest of the club’s staff was incredibly gracious. One of the hosts (who looked a lot like Hunter Hayes) genuinely looked like he was the happiest person on Earth just to be manning the front desk. When my family exited down the outdoors spiral staircase as he was coming up, he beamed and offered to take our photo for us before running upstairs, so that he could report back about getting us escorted out of the park. I’m hoping that by having made these Jack Skellington Oreo pops, I’ll please the Disney gods and they’ll let me gain entry once more into Club 33. Okay, so it’s super unlikely that anything of the sort will happen–but a girl can dream, can’t she? These ghoulish delights are a quick and easy dessert for Halloween! 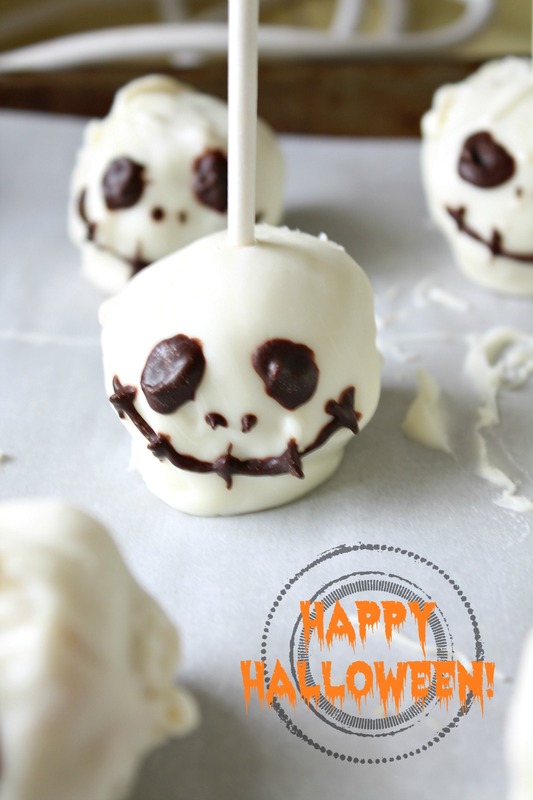 They take just 60 minutes to make and feature a Disney character favorite, Jack Skellington. In a mixing bowl, combine crushed Oreos and cream cheese. Roll into small balls and place on a cookie sheet lined with parchment paper. Freeze the cookie balls for 30 minutes. Place white chocolate in a heatproof bowl. Microwave in 30-second intervals, stirring vigorously between each interval until white chocolate is melted. 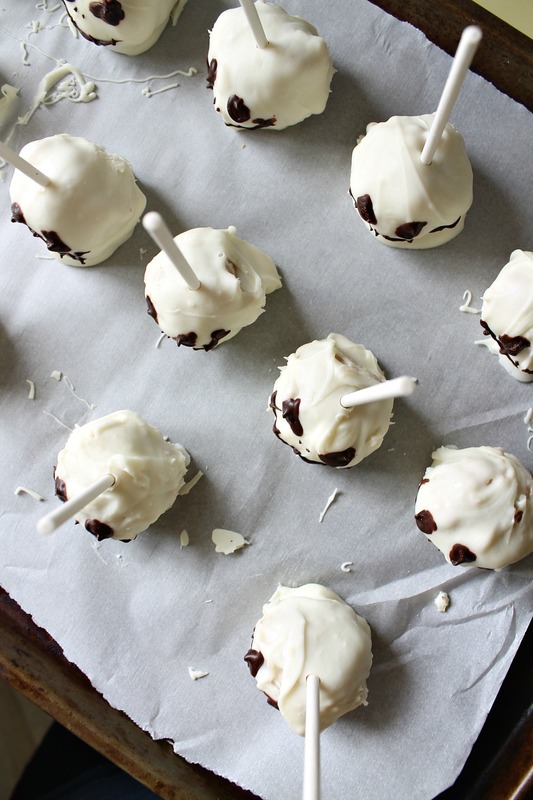 Dip frozen cookie balls into melted white chocolate, using a fork as needed to brush off excess chocolate. Place balls 2 inches apart on prepared parchment paper. Allow chocolate to set completely (you may use the fridge to speed up this process). Place semisweet chocolate in a heatproof bowl. Microwave in 30-second intervals, stirring vigorously between each interval until chocolate is melted. Transfer melted chocolate to a piping bag with a tiny hole snipped at the end. 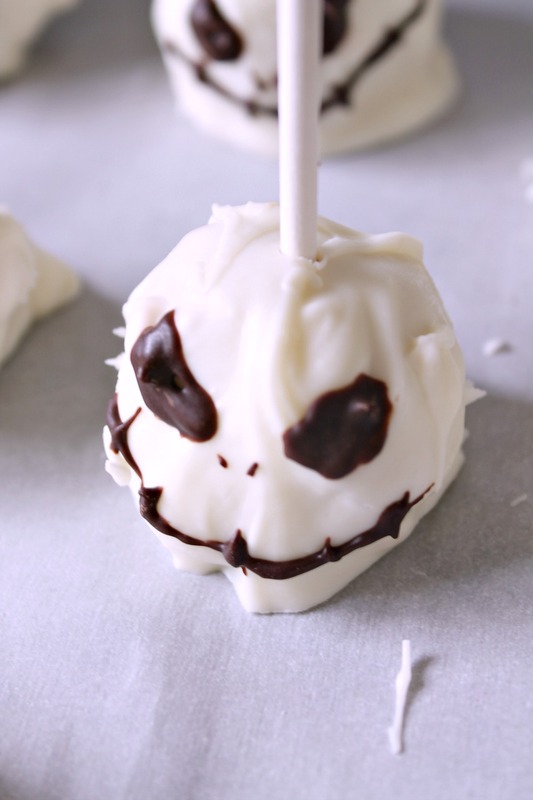 Draw Jack Skellington's face onto each white chocolate pop--a triangle-ish pair of eyes, two nostrils between-and-below the eyes, and a smile with 5-6 stitches. Allow chocolate to set, then insert cake pop sticks into the top of each pop. Enjoy! eeee I was just thinking of you and your wonderful travels, lady! thaaaaank you, I hope I didn’t desecrate these too badly hehe. Happy Sunday-almost-Monday, gal!